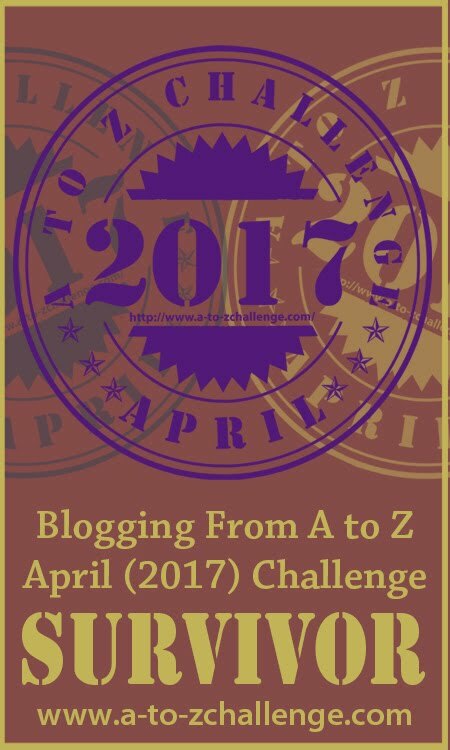 The #AtoZChallenge served as a lesson in my time management skills. When something’s got to be done no matter what, it always gets done. Sure, it requires planning and scheduling and setting deadlines. Like all important and urgent tasks do. Writing a few blog posts before their posting date was a big time saver. (Something I got to remind the procrastinator in me about not waiting until the last minute to complete stuff). It also enabled me to discover so many wonderful blogs, read and comment on them and share the posts I had liked. Versatility was a striking feature of this challenge. A plethora of themes was available for readers with all kind of interests. Shailaja churned out suspenseful flash fiction pieces with oxymorons; Modern Gypsy expressed the beauty of art journaling, rekindling the artist in me; Destiny’s Child demonstrated 26 yogasanas with stunning flexibility; IsheeriasHealingCircle impressed upon the holistic aspects of living. How heart-warming it was to read another blog on divorce in India -there was an instant connection with Kalpanaa as I could relate to what she had to say. Then there were so many travel tales with gorgeous photographs. So also lots of new recipes being dished out for different tastebuds. It indeed is a blogosphere with oodles of talent. Being a newbie blogger, I enjoyed the attention my blog received amongst several other accomplished blogs. I was noticed. I felt heard. Isn’t that such a basic human need – to be seen and heard? So it is in the online world as well! It was encouraging to read the comments from talented bloggers, conveying appreciation and encouragement. The blogging camaraderie kept me going. The stories in our life form a big part of who we are and is the basis of all our expressions. The challenge helped me identify with bloggers I would definitely like to follow and stay in touch with. These connections made online seemed as significant and special as our friendships and associations in real life. Personally for me, doing the challenge meant revisiting and reiterating all the experiences that touched my life. By writing about my spiritual growth influences helped me reconnect with them. It was a pleasant reminder of how I have evolved along the years along with life’s many other challenges! I feel great to have completed the #AtoZChallenge and am thankful to it’s organisers and promoters. To forgive or to forget? Nah, its time I work for what’s yet to come. Is a new day…every day here on.. So just go tell life – bring it on! What choices do you make at the X-roads in your life? Some speakers leave an impact as soon as you hear them. The connection is instantaneous and one that leaves you curious and thirsty for more. That’s how I felt when I first saw and heard Vishen Lakhiani online. An entrepreneur, author and speaker, Vishen Lakhiani is the CEO and Founder of Mindvalley – a leading edu-tech company that specializes in modern learning experiences and content. It publishes personal growth education by the best authors in areas such as wellbeing, mindfulness, relationships, fitness, entrepreneurship and more. With digital education platforms, content platforms, mobile apps and live events, Mindvalley has served more than three million students, subscribers and followers worldwide. I am lucky and proud to be one of them. Through Mindvalley’s various courses of transformational knowldege, one can learn to truly live the life of their dreams. So powerfully compelling is their content that enables unleashing our deepest potential. Being a student of their online spiritual school ‘Soulvana’ has brought about a fabulous shift in my mindset. I also follow their meditation app ‘Omvana’. Vishen’s courses include globally acclaimed speakers like Eckhart Tolle, Caroline Myss, Lisa Nichols, Anodea Judith, Debbie Ford, Robin Sharma and many more. There is a different kind of passion for learning induced by him. He is also the author of recently released book ‘The Code of the Extraordinary Mind’. Mindvalley has a unique company culture that makes it one of the best places to work for today. With a tagline of ‘Be extraordinary’ and by constantly pushing us to lead happier and healthier lives, Mindvalley is truly an extraordinary force in my life. Rhonda Byrne’s ‘The Secret’ was one book I remember which had aroused lot of curiosity immediately after its launch. This self-help book is based on a universal Law of Attraction which is based on the premise that positive thinking can bring about life-changing results in all areas of our life like relationships, wealth, health, career, etc. In her third book ‘The Magic’ Rhonda emphasises the power of gratitude in more detail. She takes the readers on a 28-day journey to apply this incredible knowledge in their daily lives in order to magically transform every aspect of their lives. Rhonda’s books taught me two valuable practices which I have learnt to integrate in my life: the power of creative visualisation and the power of gratitude. Its amazing how when you are open to changing the frequency of your thoughts and beliefs, your perspective towards life is altered. The universe does start showing you what you wish to manifest. It was extremely enlightening to read the teachings from renowned people like Bob Procter, Lisa Nichols, Jack Canfield, Joe Vitale and many others. When we want things in our life to change, we got to change our thoughts and habits! Some of the best books I have read have come to me when I needed them the most. One such book was ‘The Power of Positive Thinking’ by Norman Vincent Peale. This one I remember having picked during a phase when I couldn’t see beyond the heap of negativity in my life. My choices, the regrets, the sense of despair I was in, amidst the thickest and darkest clouds of uncertainty. Perhaps life has a way of putting something in your hand when you so desperately need it. It is hard for any amount of positive thinking to break through a mind so walled up with negativity. But while reading ‘The Power of Positive Thinking’, I slowly and gradually opened up to receiving the subtle messages. It made me willing to look beyond the negativity I had embroiled myself in. To start seeing streaks of light in the dark. And it is amazing how the situation you thought was only negative, may or may not change. But your outlook and perspective towards it can surely change to being optimistic. Our attitude to life is the one thing we have in control, not our circumstances. The key is to replace every negative thought by a positive one. Even if it seems like a tall order, it is possible. For people who are surrounded by the gleam of everything negative and need hope, ‘The Power of Positive Thinking’ is highly recommended. A world-renowned motivational speaker, best-selling author and global personality, Lisa Nichols is a woman I enjoy listening to. For she has a way with the words and many ways to stir your heart. She was voted as the most impressive teacher from the movie ‘The Secret’. From being a struggling single mom on public assistance to leading a multi-million dollar enterprise, her extra-ordinary personal story is an inspiration in itself. Her courage and determination to massively transform her life has filled many with the hope to bring about positive changes in their lives as well. I’m not extraordinary. I’m simply an ordinary woman who chooses every day to make extra-ordinary decisions. Lisa has appeared on The Today Show, Oprah, Steve Harvey show and many other acclaimed TV shows, making her a sought after media celebrity. She is the Founder CEO of ‘Motivating the Masses’ – America’s one of the only publicly traded personal and business development training programs. Your greatest fear is not that you are going to die. Your biggest fear is that you are going to die before you let the world see who you really are. Personally for me, Lisa made an impact when I heard her online through a few personal growth sessions. Her words are uplifting, her tone so encouraging and her intent – pure and warm. I look forward to reading her books beginning with ‘Abundance Now’.